Commercial Bank of Ceylon (ComBank) has opened its latest branch in Sri Lanka in Batapola, extending the services of the country’s largest private bank to this southern town. The bank’s 242nd branch is located on the Kahawa Road in Mahawatte, Batapola and is networked with the bank’s branches islandwide, offering the full range of services to customers in the area. The new branch is equipped with an automated teller machine that is linked to the 609 other ATMs of Commercial Bank in Sri Lanka as well as to millions of ATMs of the MasterCard, Maestro, Cirrus, Visa, Plus, Amex, Discover and Diner’s Club networks worldwide. 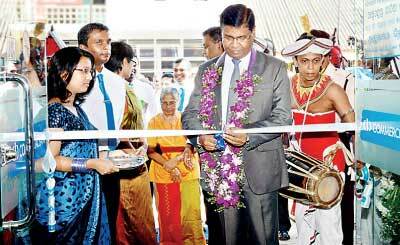 The Batapola branch was formally declared open by Commercial Bank Deputy General Manager Personal Banking Chandana Gunasekera at the invitation of Manoj De Silva, the Manager of the branch. The only Sri Lankan bank to be ranked among the top 1000 banks of the world for four consecutive years (2011-2014), Commercial Bank now operates a network of 242 branches and 610 ATMs in Sri Lanka. The bank has won multiple awards as Sri Lanka’s best bank over several years and was adjudged one of the country’s 10 best corporate citizens by the Ceylon Chamber of Commerce in 2013 and 2014. The bank has been rated the Most Respected Bank in Sri Lanka by LMD for the past 10 years, has been the second Most Respected Corporate entity in the country overall for the past four years and been rated No 1 in Sri Lanka for Honesty in 2013 and 2014 by the magazine.